Blessing Bags - It's for the homeless! 1. Have you ever heard of giving someone a "Blessing Bag"? 2. 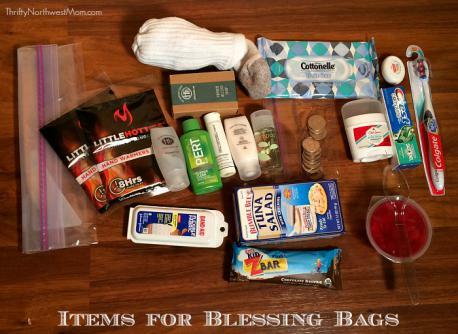 For a while now there's been a circulation that if you want to help a homeless person to give them a "Blessing Bag". The contents placed in a large Ziploc bag would include, toothbrush, toothpaste, hand warmers, shampoo, money, band-aids, sanitizer, snacks, etc...would you consider giving this to a homeless person? 3. There's been a bit of a controversy on this, as a former homeless person wrote in a blog that this was not a good thing, that if you want to help the homeless giving money is more appropriate. Do you give money to the homeless? 4. He went on to say that there's a difference between a beggar and a homeless person, do you agree that he has a valid point? 5. https://lilyarayne.wordpress.com/2014/01/22/why-i-have-a-problem-with-blessing-bags-for-the-homeless/, this is the blog, will you read it to know more about the differences between being homeless and a beggar?